March 18, 2012 by Alphageek in "alphageek", "review", "urbanspoon"
The 2400 Diner is one of those places that everybody knows about. In this case, that is a good thing. This restaurant has been around for more than a while with good reason. 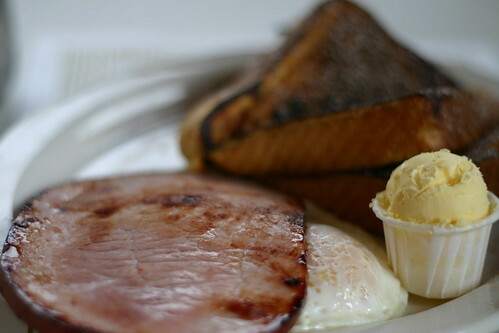 The 2400 Diner offers great service, straightforward food, and reasonable prices. We stopped in, and there was hardly anywhere to sit. This has been a popular destination for years, especially for the meal we were going to enjoy, which is breakfast. Having eaten here before, I can testify that they make many great dishes, but they make one of the best breakfasts in Fredericksburg. I always like eating here, because of the small, family feel the place has. It looks like the seats were upgraded with new material recently, and they look great. One would never know how long the restaurant has been around, based on the interior. I certainly am not going to tell anyone either. We started out with some coffee. Coffee can be a little hit and miss at small diners, but the 2400 Diner nailed it well. We each picked out a breakfast. 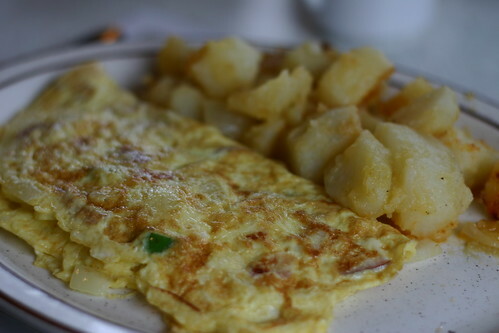 Below is my Western Omelet, potatoes and toast. It was simple and delicious. What more could I say about a great omelet? I did like the fact that it was not destroyed by cheese. Sometimes, an omelet has so much cheese that the taste of everything else is lost. Not so here, the omelet's simple tastes were on display. Mrs. alphageek ordered the short stack French Toast with ham and two eggs over easy. I took a sample of her dish, and thought that it was a great breakfast. Sorry, for some reason the camera focused on the butter instead of everything else, but the camera refused to behave for me. Everything came out great, and I really liked the simple balance of crispness and flavor in the French Toast. I almost wish I ordered French Toast too. We left very satisfied. This is one of the best breakfast places in Fredericksburg as the crowds were showing. This is one of those restaurants that you might not always remember, but you are missing out on a great experience. Like this review? Don't forget to follow our Facebook page over on the left to get all of the alphageek news, including restaurant reviews, equipment, and cooking ideas.